SOS Children’s Village, an Hojai-based NGO, celebrated the SOS Day as a tribute to their founder, late Dr. Hermann Gmeiner,on Saturday with much fanfare. The celebration marked the 99th birth anniversary of Dr. Gmeiner who was instrumental in laying the foundation of SOS Children’s Villages in the world. The programme began with lighting of a lamp and floral tribute to Dr. Hermann Gmeiner followed by a welcome song presented by a group of the SOS Children’s Village, welcome speech delivered by Village Director Paresh Badyakar. 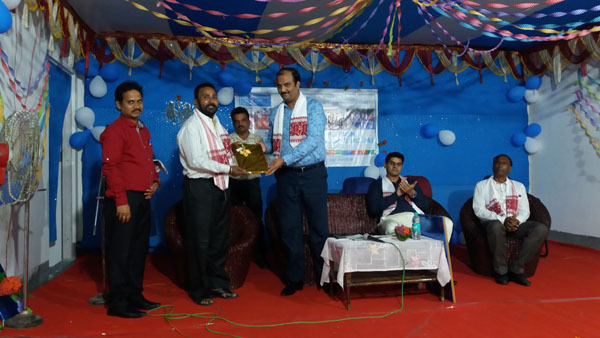 Deputy Commissioner of Hojai, Manvendra Pratap Singh, graced the occasion as the Chief Guest, Superintendent of Police Ankur Jain, as Guest of Honour, Child Welfare Committee chairperson Chidananda Nath as Special Invitee and senior journalist Ramesh Mundra as Special Guest. DC Manvendra Pratap Singh and SP Ankur Jain shared their experience and explained in detail how one needs to be dedicated to achieve their target. CWC chairperson Chidananda Nath explained in detail about the rights of children. Senior journalist Ramesh Mundra was also honoured by SOS Children’s Village authority for his invaluable contribution towards the society with his writings and specially highlighting SOS Children’s Village activities. He was presented with a certificate of appreciation, SOS citation, gamosa and bouquet of flowers by DC MP Singh. The children, who have excelled in the HSLC, HSSLC examinations 2018 and in preparatory class examination were felicitated. A cultural programme was also organized which saw enthusiastic participation from the children and also a play with the message ‘To Stop Bullying’. Earlier, Assistant Village Director Chitaranjan Mahantii read the message sent by president of SOS Children’s Village of India, S Sandilya and general secretary Anuja Bansal. The celebration was witnessed by over 300 people including the children, mothers, employees and dignitaries.